to DIY and retrofit options. This has become the normal standard that has come to be expected and accepted. on how they could apply their success to a turnkey product that could reinvigorate and revolutionize the LED industry. at a design and wonder how it could have been any other way. It should seem utterly obvious, regardless of the scale of innovation or redesign. It was with all these considerations in mind that the Vertex engineers developed the Illumilux . • 3W Cree XPE LED’s, the most efficient LED’s in the industry. • Crafting the body from a durable, anodized extruded aluminum shell, allowing the entire body to serve as an effective heat sink. to power all linked light strips from a single power cable—no tangled or excessive cords to distract from the elegance of the display. In incorporating these features, Vertex also placed equal emphasis on the aesthetics of the product. Drawing from the acclaim of the Illumina, and answering the demand for an artistically polished unit, the Illumilux is balanced, structured and complete. aesthetics at a price that invites all aquarists to redefine their expectations for aquarium lighting. One platform--multiple-functionality. Can be used as a primary or supplemental source of lighting to add shimmer and color to fresh or saltwater displays. • Expandable, modular design allowing full user flexibility. • Individual beams can be network in any shape and configuration using PCB connective fittings. 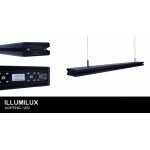 • Wireless power networking between interconnected fixtures. PCB connections supply all power and control. • Only one power cable required to power each array (requires Vertex Splitter box). • Sleek, attractive and durable Anodized Aluminum body resists corrosion while maximizing heat dispersion. • Fully upgradable LED boards can be swapped out with no wiring or soldering. • Optional inline 1-10v module for dimming, sunrise/sunset simulation. • Fully compatible with the Vertex Cerebra or any other device capable of regulating 1-10v signals. • 6 Cree XPE LEDs per 300mm/1‘, each LED operating at 750 mA/~2.5W. • Expected LED life time 60,000 hours @ 125 degree core diode temperature (Per Manufacturer). • Available in 90-270 V / 50-60Hz. • Can be mounted (Tank Bracket Accessory) or suspended (Hanging Kit). • Mean Well Drivers - 1 year warranty, certified UL/CSA/TUV/PSE/EMC/ETL/GS. • CE, EMC and RoHs Certified. • Designed and manufactured by Vertex Aquaristik - Made in Austria. 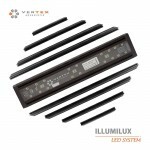 VERTEX ILLUMILUX VERTEX ILLUMILUX FEATURES One platform--multiple-f..
VERTEX ILLUMILUX FEATURES One platform--multiple-functionality. Can be used ..